^ a b "Are You There God? It's Me, Margaret". deletecensorship.org. Half Price Books. 2014. Archived from the original on 2016-06-28. Retrieved 2016-11-30. ^ "Most Frequently Challenged Authors of the 21st Century". ALA.org. American Library Association. Archived from the original on 2016-09-05. Retrieved 2016-11-30. ^ a b Blume, Judy. "Judy Blume on the Web: Judy Blume Talks About Censorship". judyblume.com. Judy Blume. Archived from the original on 2013-12-01. Retrieved 2016-11-30. ^ Knox, Emily J.M. (2015). Book Banning in 21st-Century America. Lanham, Maryland: Rowman & Littlefield. p. vii. ISBN 9781442231689. ^ Blume, Judy. "Judy Blume on the Web: Are You There God? 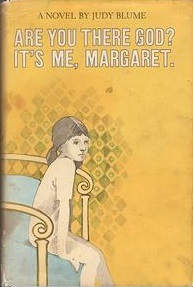 It's Me, Margaret". judyblume.com. Judy Blume. Archived from the original on 2013-11-26. Retrieved 2016-11-30. ^ Grossman, Lev (6 January 2010). "All Time 100 Novels". Time Magazine. Retrieved 21 January 2015. ^ "100 Most Frequently Challenged Books: 1990–1999". ALA.org. American Library Association. Archived from the original on 2016-11-13. Retrieved 2016-12-18. ^ "Top 100 Banned/ Challenged Books: 2000-2009". ALA.org. American Library Association. Archived from the original on 2016-12-13. Retrieved 2016-12-18. ^ Mike Fleming, Jr. (October 17, 2018). "Judy Blume Grants 'Are You There God? It's Me, Margaret' Screen Rights To James L. Brooks & Kelly Fremon Craig". Deadline Hollywood. Retrieved October 18, 2018.